Only Account owners can upgrade a plan directly in the app. If you prefer, get in touch and we'll sort it out for you. You can upgrade and/or downgrade at will, and only pay for the time you used the plan. 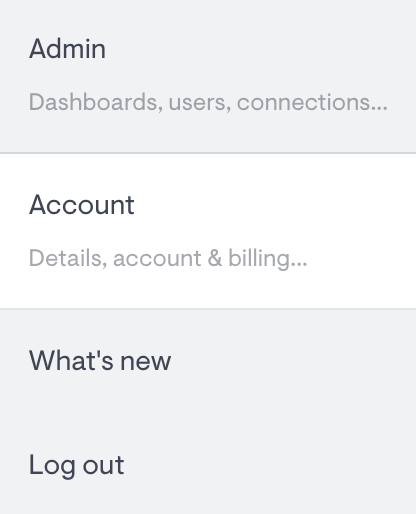 For example, if you sign up for a $49 subscription (Basic with up to 2 dashboards), then upgrade to a $159 subscription (Team with up to 10 dashboards) after a week and return to the $49 subscription a week after that, you'll get credit for the unused time the following month. Same applies if you're on an annual subscription and decide to upgrade. When you first subscribe you enter a billing cycle (if you subscribe on 25th September your cycle goes from the 25th of a month to the 25th of the following month). If you were to upgrade in between your billing cycle, your first payment will be prorated for the difference. Click Choose plan and you'll see the following options. Switch between monthly and annual billing. Once you've selected your plan, click Select this plan and follow the steps to update your billing and payment information (if you haven't already). 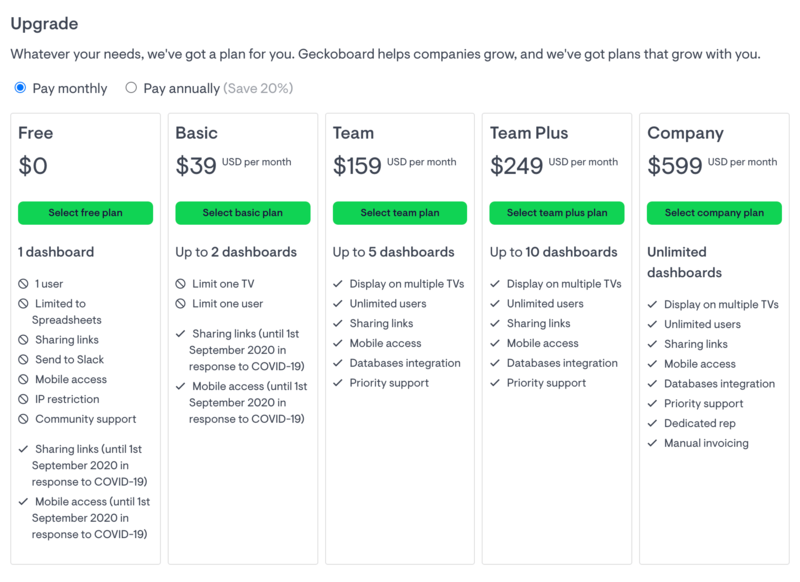 If you're on a manual-invoiced subscription or need additional help upgrading, please contact us at billing@geckoboard.com.